After wasting much of Saturday dithering about whether to hunt for goat meat in Little India, I was determined to get something out of the weekend by spending a few hours in Chinatown on Sunday afternoon. 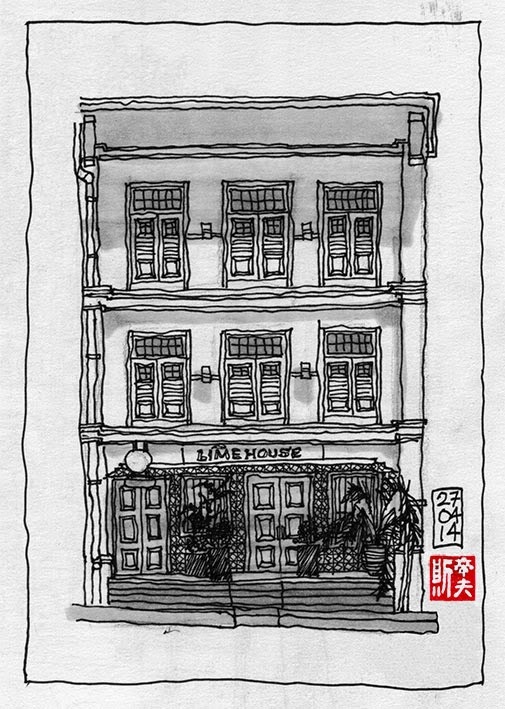 One objective was a doodle of the Lime House restaurant on Jiak Chuan Road where we ate with a friend on Friday evening. Hence the reason for the goat meat quest which will now take place over the Labour Day holiday weekend. With the sketchbook closed, I strolled towards the heart of Chinatown just to check that there were no goat meat salesman in Kreta Ayer market. On the way there, I passed a chap called Jason painting on a stool who was a member of the Singapore Sketchers group. The only stalls still open in the basement were selling vegetables, frogs and pork, but alas no goat. On the upper levels, groups of raucous men sat round tables while women opened bottles, topped up glasses and cleared huge stacks of empty beer bottles which teetered precariously on upturned crates. While I sipped a cold Tiger, the hawker centre loonie who, perhaps fuelled by the odd Tiger himself, demonstrated how to bend a bottle cap with one hand. I wondered how I was going to escape, but thankfully he was distracted by the leftovers on an empty table. I queued for duck and pork for dinner and then went in search of vegetables. 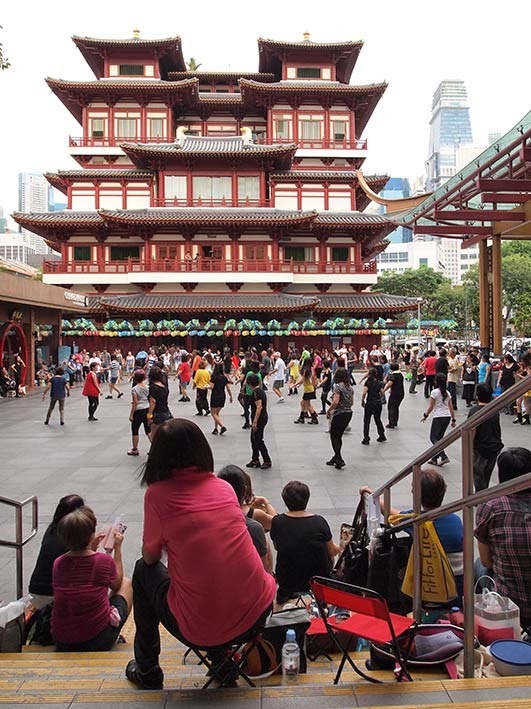 With flimsy and aromatic carrier bags in hand, I walked back to the car only to be sidetracked by a large crowd gathering in front of the stage on Kreta Ayer Square, directly behind the Buddha Tooth Temple. 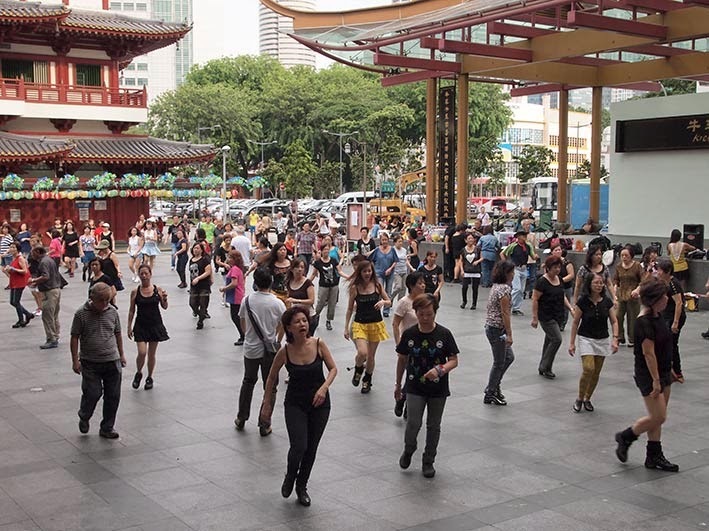 Women dressed in line dancing outfits with heavy shoes, thick socks and even the odd cowboy hat and frilly frock, formed lines and began to dance to Country and Western tunes. Small groups of women were camped around the square where they returned after each dance to cool down and take on water. A few practiced moves in preparation for the next song. The audience began to grow. Even the old men playing board games had turned round. Everyone was enjoying the spectacle, except perhaps for the group of monks that were visiting the temple who looked distinctly uncomfortable.